Being a vegan can sometimes be a bit of a barrier when it comes to gorging on delicious desserts as when it comes to baking, eggs is usually a key ingredient. 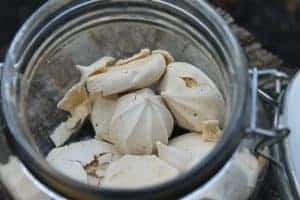 If you saw our other blog on the vegan egg replacement, aquafaba, you can use that to make this delicious vegan meringue! Water from one tin of chickpeas. Whisk the chickpea water with electric whisk at high speed until the liquid forms stiff peaks. Slowly add in half to 3/4 cup sugar, according to taste, until mixture is glossy and thick. Just like an egg-based meringue, you should be able to turn the bowl upside down over your head without anything dripping on you! Spoon onto parchment paper and place in a preheated oven at 100 degrees C for 90 minutes. After this time, turn off the oven and leave the meringue to cool inside. Now you can make all sorts of indulgent treats for the vegetarian/vegan in your life (and yourself) without any extra fuss whatsoever!